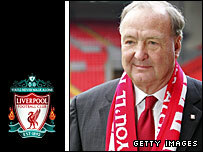 Tom Hicks says he is prepared to block any attempt by co-owner George Gillett to offload his stake in Liverpool. Reports suggest Gillett may be ready to sell his shares in the club. But Hicks told the Fort Worth Star-Telegram newspaper: "Not only am I not going to sell, my partner cannot sell without my approval. "So I kind of have the ability to determine the outcome of what is going to happen, and I am right in the middle of that." He added: "For a lot of reasons I can't discuss, I haven't been able to fix it yet. But I am preparing to be in a position to fix it." What is your view of Hicks's stance? American pair Hicks and Gillett beat off competition from DIC to take over Liverpool in February 2007 and own 50% each. But since then, they have become increasingly unpopular among Reds fans, drawing criticism for their treatment of manager Rafael Benitez and their financial management of the club. Dubai International Capital has recently revived its interest in the club but to take control, it must buy all of one man's shares along with at least some of the other's.